Kloner | XKV8R: The Official Blog of Robert R. Cargill, Ph.D. Images of the 'Tomb of Absalom' (1 C. CE Jerusalem) flank an image carved into an ossuary. Photo credits: Left: Brian796 (http://blog.travelpod.com/travel-photo/brian796/2/1264692913/the-tomb-of-absalom.jpg/tpod.html). Center: MSNBC Cosmic Log (http://cosmiclog.msnbc.msn.com/_news/2012/02/27/10521007-new-find-revives-jesus-tomb-flap) Right: Ariel Horowitz on Wikipedia (http://en.wikipedia.org/wiki/File:Avtomb.JPG). In fact, the image in the book is so poorly reproduced in my copy that one suspects it has been intentionally altered so that no one could see what the the image really is. Indeed, the image actually seems to resemble a nephesh, or tomb monument, like those found in many places in Jerusalem in the first century CE and depicted on ossuaries of this very period (so for example in fig. 13 or 30 of Rahmani’s A Catalogue of Jewish Ossuaries, 1994). A nephesh is the above-ground monument of a tomb that marks the tomb below and the one(s) buried there. I must emphasize that I am confident the engraving is simply a standard “nephesh tower motif,” an ornamental motif that is fairly widely attested on the corpus of ossuaries. In fact, in Rahmani’s discussion of the ornamental motifs of ossuaries, the first ornamental motif he mentions is that which has the appearance of a tomb façade or nephesh tower. (Rahmani, L. Y., 1994. A Catalogue of Jewish Ossuaries in the Collections of the State of Israel. Jerusalem: Israel Antiquities Authority, p. 28). By the way, the features of this ossuary’s ornamentation that Jacobovici and Tabor contend are the “fins of a fish,” are actually a standard feature of a roof, namely, the eaves (which, of course, are important for directing the water away from a building). 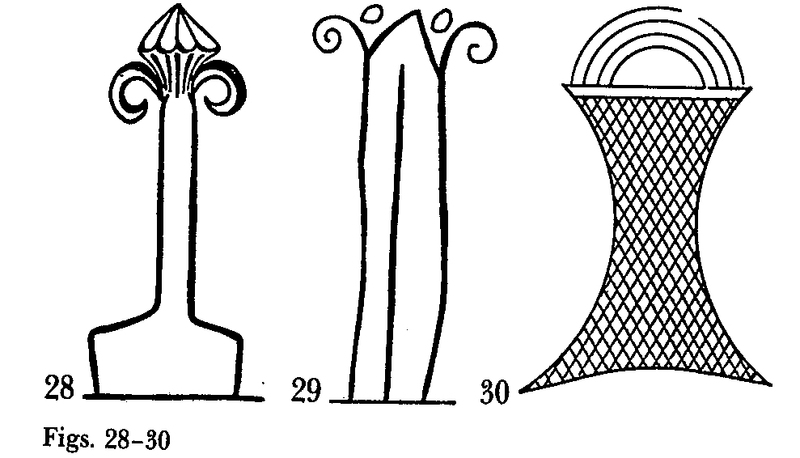 Note also that eaves are visible in multiple of Rahmani’s drawings of ossuary ornamentation. In short, this is not a fish. It is a nephesh tower or tomb façade. The initial thought that came to my mind was the so-called Tomb of Absalom (that we coincidentally discussed today in my “Jerusalem from the Bronze to Digital Age” class at Iowa). The shape of the figure resembles the shape of the Tomb of Absalom, which is dated to the 1st C. CE in Jerusalem. I suggest that the “round” figure at the top of the ossuary image may be an attempted representation of a lotus flower that Kloner and Zissu state is carved into the top of the Absalom monument. (Kloner A. and Zissu B., 2003. The Necropolis of Jerusalem in the Second Temple Period. Yad Izhak Ben-Zvi and The Israel Exploration Society. Jerusalem (in Hebrew), pp. 141-43.) It certainly could be interpreted as an attempt at the petals of a flower. Likewise the lower panels of the image could be an attempt at a representation of the tomb’s pillars. 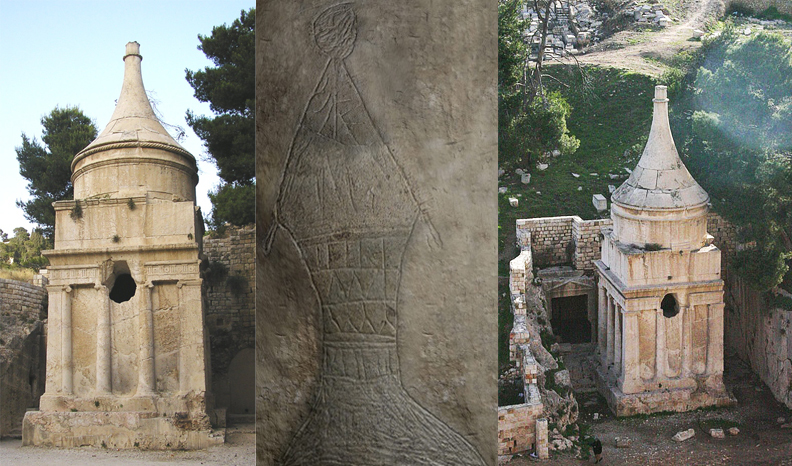 Images of the 'Tomb of Absalom' (1 C. CE Jerusalem) flank an image carved into an ossuary. Photo credits: Left: Brian796. Center: MSNBC Right: Ariel Horowitz on Wikipedia.